The Wolf Pack Climbing Lycan Brush gives you plenty of options for cleaning your holds to give you a better climb both indoors and outdoors. 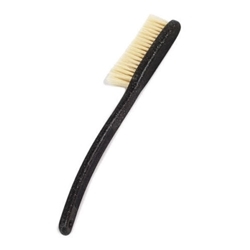 Made of 100 percent boar hair, the Climbing Lycan Brush has a wider head and stronger neck to provide you the exact positioning you need, and it doesn't polish or damage rock so you still get a secure grip. An advanced design gives the Climbing Lycan Brush durability for the long haul, yet is flexible enough to get at those hard to reach places. A sleek profile allows the Climbing Lycan Brush to fit perfectly on most chalk bags and bouldering buckets, and a secure grip provides a great hold in a variety of situations. A top feature is the integrated file that lets you get rid of annoying calluses or anything else that needs filing down.